Villagers said that the Burma Army put up the placards on the disputed land on July 20. Villagers said the original landowners are currently in negotiations to get back their confiscated farmlands returned to them through the government’s Land Acquisition Investigative Commission. In its first few months of operation the Land Acquisition Investigative Commission was swamped with land confiscated cases from villagers. Within months of opening its doors it had received more than 2,000 land-conflict cases. A report by the Transnational Institute (TNI) – Developing Disparity – Regional Investment in Burma’s Borderlands noted that individual members of parliament had also received hundreds of complaints over land confiscation. Villagers in the Htantabin Township region said that Burma Army’s 49th Infantry Battalion under the Southern Command and based in Taungoo, marked the boundaries around 30 acres of the disputed land with placards. Villagers claimed that Saw Maw Kae and Saw Htar Taw Htaw from Aung Myay and Pyin Khan villages originally owned the land ‘marked’ by the Burma Army. Speaking to Karen News, a villager from the area, who asked not to be named, said. The disputed land areas ‘marked’ and claimed by the Burma Army have raised another potentially, explosive complication – the lands are those that the Karen National Union had measured for registration and issued land grants to villagers in March, 2013. The KNU’s Central Committee member, Saw Thamain Tun, told Karen News that the government promised to recognize land owners who have been issued land grants by the KNU as agreed during ceasefire talks. According to villagers, Captain Myo Zin Tun, from the Burma Army’s 49th Infantry Battalion, has been leasing out the ‘marked’ confiscated farmlands to Kan Gyi villagers. 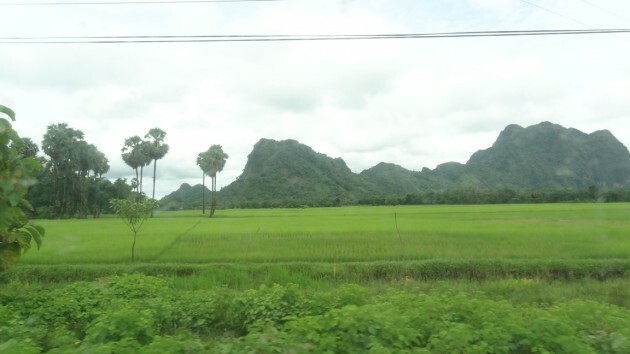 The disputed farmlands are located between Ta Phay and PyinKan villages and villagers cultivated there since 1962 – the Burma army confiscated the land in 1987. A report released in February 2013 by the Karen Human Rights Group’s– Losing Ground – documents villagers’ testimony of land confiscated by the Burma Army for its own use or for use by foreign owned development projects.